Okay, this Friday calls for an exciting book review for an exciting book. 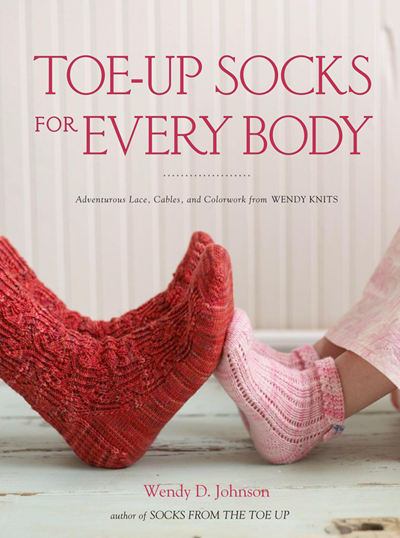 Wendy Johnson of WendyKnits has a new book following her Socks from the Toe Up; the first one introduced the toe-up concept pretty thoroughly and understandably; the second builds on that foundation for an explosion of possibilities for the more confident sock-knitter. Due for release March 23, with Socks for Every Body, Wendy shows a breathaking array of appealing sock designs and Potter Craft delivers clear, well-styled photography. My first pair of socks was a disappointment. A holiday present for my mom, they were knit top-down in hand-dyed Sophie's Toes sock yarn; well, the yarn was gorgeous, and I did learn to turn the heel, but after all of that knitting, the soft-as-a-dream socks didn't fit. My mom appreciated them, but only wore them as meditation socks in the winter, for, you know, sitting. Because they'd slide down and fall off if she tried to walk in them. Wendy's first book really turned me around. After reading it, I understood how to start at the toe and allow my mom to try on her handknit socks at every crucial point and come out with perfect-fitting hose she could really wear. Socks for Every Body takes sock knitters to the next level, with elegantly-designed cable, lace and colorwork socks for women, men and children, and with variations like the Belle Epoque Thigh Highs and a couple of different colorwork charts for kids' socks. Wendy starts with a solid refresher in toe-up knitting, then explains the patterns with her characteristic practicality and good humor. Many of the socks in the Cables section, like the Bob and Weave and Ironwork Socks are designed for men or women, and several designs for kids' socks means the book lives up to its name. I love that Wendy doesn't shy away from colorwork; the Sanquhar Socks, Star Flower and Norwegian Rose socks are my faves. The author's delight and passion for socks shines through all of her designs, in the complex and fun-to-knit arans/cables and lushly detailed lace patterns. She's a virtuoso of the sock world. And, guess what? Wendy Johnson will be featured in the Knitcircus Summer Issue, with an exciting article that will allow our readers a glimpse into her design process. Have I mentioned how excited I am? After reading Socks for Every Body, I want to join the party! It's sock-knitting from the toe up this time. And tomorrow, bright and early, it's off to the Knit In for a day of fun. Sophie's Toes sock yarn will be there…..